“Modern TSM dressers?” I hear you say. “Nix u drunk?” I’m as sober as a judge, I assure you – but I’m not sure about the good folks at EA. 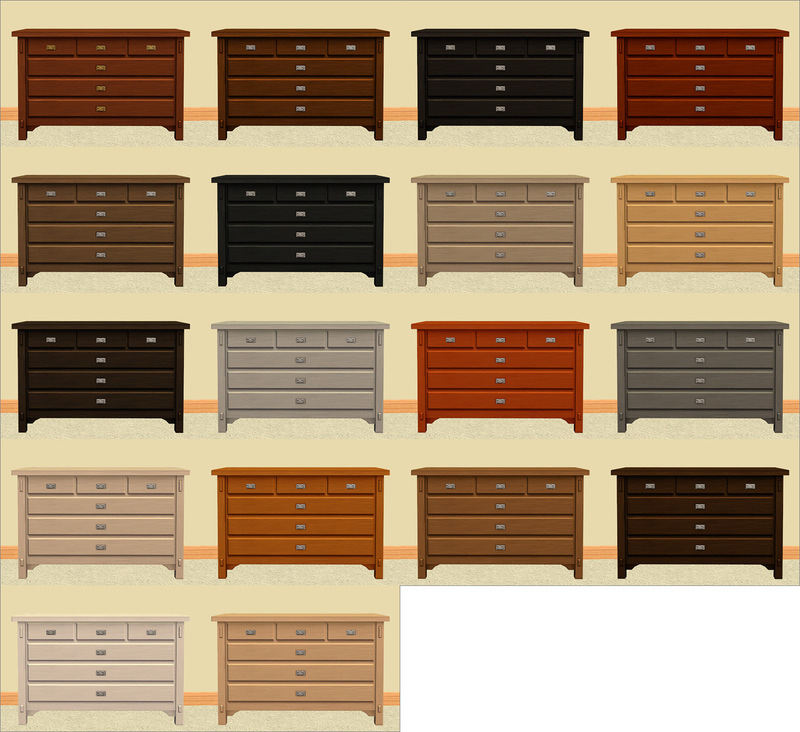 Just like their medieval friends, these dressers have five slots each – and they are of course animated as well. They are also low in poly, with a maximum of 415 polys/tile. Since I had no TSM catalogue description to work with, and have no imagination whatsoever, I’ve simply given these dressers their TSM file names. The first one is the Mission Dresser for $425. Yelena has had some time off while I’ve been doing medieval stuff, so she’s happy to be back to show us some dressers. This Primer fellow disappeared against a lighter background, so I let Yelena pick a different one. What can I say, she likes green. …and finally the Modern Dresser (also seen in the title pic) for $550. This entry was posted on 27 March, 2014 at 18:21	and is filed under Animated, BUY MODE, CONVERSIONS, DOWNLOADS, Dressers, TSM. You can follow any responses to this entry through the RSS 2.0 feed. You can leave a response, or trackback from your own site. What a serendipitous discovery!! How delightful. ” Mixed in with the medieval ones were four decidedly modern dressers, with decidedly modern clothes in their drawers.” Thank you for spotting this and then making the conversion for us. Great Work, Johanna! Thank you! ❤ Funny thing is, I didn't notice anything strange when I was extracting these, I just looked for files with "dresser" in the file name and didn't dwell on what they were called in addition to that (besides, the TSM file names are usually rather terse and have little to do with what the object is called in game, so something like "dresserMediumLuxury" isn't an odd name in any way). It wasn't until I was importing the meshes into Milkshape that I noticed that some of them didn't quite look quite as medieval as you would expect. Very, very snazzy. Thanks, Nix. Hi, these are very nice! All three of them are from the Sims 3 though, I recognize them. No idea why they were in medieval. Thanks. Funny, but you’re the first one who’ve said you recognise them from TS3. I suspected that might be where they’re from, but since I don’t have TS3 and don’t play it, I couldn’t confirm it.